Editor marks issues with red, blue, or gold underline for spelling, grammar, and stylistic issues, respectively. Right-click the underlined word, and then choose the suggestion you want, or learn more about the error and how to correct it. Editor provides enhanced proofing tools for Office 365 subscribers. 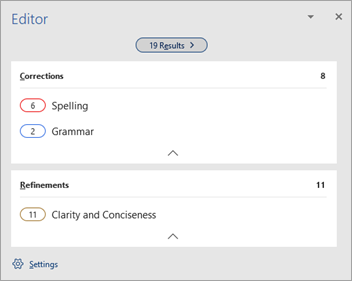 Behind the scenes, intelligent services identify spelling, grammar, and stylistic issues, and the Editor pane helps you understand suggestions so you can make choices that improve your writing. On the Review tab, select Check Document. The Editor pane categorizes spelling, grammar, and stylistic issues. Click each category to address the issues. Note: For keyboard shortcuts in the Editor pane, there's no need to press Alt. Just use the underlined letter to select the command (like i for Ignore Once, g for Ignore All, etc) . In the Editor pane, click Settings. For Writing Style, select Grammar & Refinements . Scroll down to see all of the options available, and select or clear the rules you want. The settings apply to all the documents that you edit, not just the current one. On the Mac, Editor is available only to Office Insiders. Internet connection: Make sure your connection is working. Intelligent Services switched on: Go to File > Options > General and turn on Office Intelligence Services. Grammar checking is available in Arabic, Chinese (Simplified), Chinese (Traditional), Czech, Danish, Dutch, English, Finnish, French, German, Hungarian, Italian, Japanese, Korean, Norwegian, Polish, Portuguese (Brazilian), Portuguese (European), Russian, Spanish, Swedish, and Turkish. Context-sensitive spelling (for example, detecting the difference in English between two, to and too) is available in English, French, German, Italian, Norwegian, Portuguese (Brazilian), and Spanish. Writing assistance (gold underline) is available in English, Spanish, French, Italian and German. Read Aloud doesn't support languages that use right-to-left writing systems. Read Aloud reads text in the default speech language of your operating system. For information about how to add additional text-to-speech voices, see How to download Text-to-Speech languages for Windows 10. On macOS, this feature is only available to Office Insiders right now. Select File > Options > Proofing. Turn on Frequently confused words and Mark grammar errors as you type. Note: Because Editor is a new feature in PowerPoint, not all grammar mistakes are covered. But the feature will get smarter and cover more grammar and writing errors over time. In PowerPoint, on both Windows and macOS, Editor is available only to Office Insiders. In PowerPoint, Editor currently works best when the user interface and text are in U.S. English. If you installed Office from the online Microsoft Store, Editor isn't currently available, but it's coming soon.